Updates That Only Look Expensive! Need to update your home’s appearance but have minimal funds available to do so? Not a problem! Check out the following ideas. * Can’t afford to paint the whole room? Give the walls a good wipe down with a damp cloth getting off fingerprints and dust. Then paint the trim a crisp bright semi-gloss white. This will pop your existing wall colors and offer a fresh, clean appearance. This is just as effective on your home’s exterior! * Wash you windows, inside and out. Plus wash the screens and the window bases as these both hold on to a lot of dust and dirt that has been blown in during rainstorms or windy days. * Thoroughly wash the area around your front entry and if necessary, refresh the trim and doors with paint. Then add a decorative wreath, floral spray, door knocker, or whatever fits your decor to the front door. * Clean your window treatments. Many drapery panels and sheers are machine washable. Put them through the gentle cycle and then hang while damp so they don’t shrink. If you have fabric blinds or shades, carefully dust on a regular basis so as not to let the edges get trimmed with dust. Make sure and clean valances and rods as well. Note: If your treatments are outdated or have frayed edges, replace them! There are many very inexpensive yet attractive options at stores such as Target, Walmart, JC Penney, Sears, Kmart, etc. that even boast designer names at generic prices. * Need to refresh your cabinets? Remove grease with a soft cloth dampened with a mixture of warm water and Dawn dishwashing liquid. This will break down the grease. Then wipe with a clean dry cloth. Next use an old time favorite, Murphy’s oil to give them a fresh sheen. * Cabinets clean but inhibited by old hardware? Maybe you have a lot of hardware to replace which creates a cost issue or you love the original hardware but not its worn out appearance. Either way, head to the hardware or big box store and buy a can of Rustoleum (or similar brand) spray paint. You can choose to create an unfinished, painted, metallic or hammered finish in a multitude of colors or looks (bronze, oiled bronze, antique, etc). Follow the directions for prepping and then spray them all, let them dry and then re-install. Fabulous!! * Live in a historic or century old home with big heating registers that look like they haven’t been updated since the house was built? Use the same painting method described above to update and refresh them while maintaining the home’s true character. * Change your faucets. The big box stores have a multitude of choices that look expensive yet are very affordable. This is also a project you can do yourself further reducing your cost. 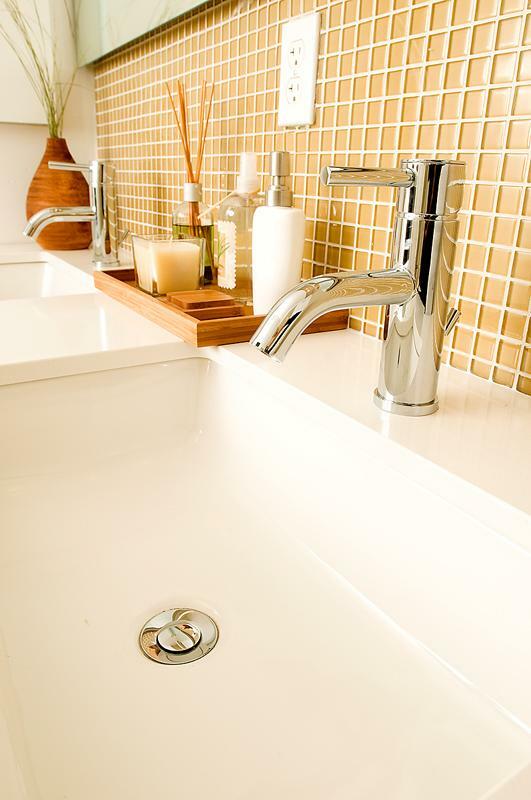 If you like your faucet, try adding a glass tile back splash. * Have an old stained or scratched sink but can’t afford to replace it? You can buy paint specifically for painting sinks and tubs. It is important to follow the directions and protect your tile or walls while doing so BUT the payoff is huge while the cost is minimal. » Is Your Home A Target For Burglars?